The world’s most celebrated athlete standing on the podium in Rio in honor of receiving yet another gold medal has something important in common with your lazy uncle throwing back a cold one in his Barcalounger. Yes, swimming powerhouse Michael Phelps, purple-spotted from cupping therapy, and your slovenly relative with a beer gut both share a bond — a weakness in succumbing to the allure of voodoo medicine. Modern-day snake oil salesmen hawking quick cures and TV doctors peddling the latest diet miracle with blatantly ridiculous claims are everywhere on the tube, social media, the supermarket and old-fashioned billboards. Anecdotes and celebrity testimonials have in many cases replaced evidence-based medicine in our popular culture. Diet, nutrition and medical claims are thrown together in an olio of nonsense of false promise and false hope. Let’s pause here a moment. Before ripping further into the obvious drawbacks of voodoo medicine, that is, any medical claims absent substantiating data, let’s first emphasize that of course evidence-based medicine (often called western medicine) has its own set of serious problems and significant limitations. Clinical studies can be and have been tainted by pharmaceutical company sponsors or by doctors with financial interests in the outcome; negative data can be buried or manipulated; drugs shown to be safe in small trials can turn out to have significant or even deadly side effects in a broader population; treatment can lead to addiction; and interactions among different drugs can be hazardous. Biology is complex, and our understanding of disease incomplete, meaning that treatments are often hit or miss or luck of the draw rather than based on first principles. Perhaps the biggest flaw with modern western medicine, though, is that we have created a false expectation that our ills can be cured with a pill when it fact the cure more often lies in making difficult lifestyle changes. Smoking, lack of exercise and overeating come to mind. But these flaws in modern medicine are, in theory, amenable to improvement because the foundation is evidence-based. With scrutiny and reproducibility comes an accountability that will eventually expose weaknesses to be addressed. Or at least that possibility exists, which is not the case for claims that are made with no attempt at rigorous evaluation — like cupping. Cupping can be traced to ancient Chinese practices used ostensibly to treat a variety of ailments including arthritis and muscle soreness. There is no credible clinical evidence that cupping is anything more than a placebo — or one big hickey — with no medical benefit at all. And consider this question — did you see any of the Chinese athletes doing cupping therapy? Think about it. Perhaps if this ancient Chinese treatment really worked over millennia we might see Chinese athletes partaking of its benefits? These therapies and treatments all share the same fatal flaw; none has undergone rigorous clinical studies to determine safety and efficacy. In the absence of such trials, it cannot possibly be known if the drug or treatment is effective, if there will be serious side effects, if it will actually make the condition worse, or it will interfere with drugs or treatments that would otherwise help. Wishful thinking is not a viable treatment plan. In the absence of rigorous evaluation, you simply cannot know if your favorite treatment or supplement works no matter how many convincing testimonials you hear or how many anecdotes you may read. You or Grandma or Aunt Tilly or your best friend are just making it up based on lore and hearsay, no different than randomly going into a supermarket, picking out a package of peas and claiming that eating half a bag a day (but only if eaten at noon) will cure arthritis. The claim is convincing if the familiar face of a celebrity testifies that eating a bag of peas each day at noon will cure your ills or if an actor dressed as a doctor, removing a pair of glasses to simulate intimacy, solemnly attests to the benefits of pea eating. But testimonials and anecdotes do not make the claim any more valid. You might think chelating works because someone you trust told you so — but you are doing nothing different than picking out that bag of peas. Well, no, inflammation does not control our lives. Like many others, this author claims inflammation is responsible for a huge range of maladies, ranging from Alzheimer’s to lupus to stroke to fibromyalgia; I counted 30 on this site. This is nothing but cringe-worthy. Yes, inflammation is terribly important, and is associated with disease. But the oversimplification and weak link to biology that we find on sites like these are misdirection from understanding what is actually happening in our bodies. Such misunderstanding leads to odd nutritional or medical recommendations that are useless at best or dangerous at worst. “Chronic inflammation is the root cause of many serious diseases.” No it is not; it is an important step, but one of many, in the progression of diseases generally caused by bad habits. “Inflammation is the cause of nearly all disease.” Wrong at every level; there are many diseases not associated with inflammation, and it is not typically the cause of disease. Rather inflammation is a pathway to pathology shared across many diseases. “Ginger and turmeric have been shown to have anti-inflammatory properties.” I love ginger and turmeric, but there is scant epidemiology to support the claim. It is just wishful thinking and the kind of bogus claim that distracts us from reality. “Excess sugar intake will contribute to inflammation. It’s not just the obvious sugar but also the hidden sugars.” There is no such thing as hidden sugars; and sugar itself has nothing to do with inflammation, other than adding calories, which in excess we know can cause inflammation. “Phytochemicals – natural chemicals found in plant foods… are also believed to help reduce inflammation.” There is no evidence for this statement. Of course, eating plant rather than animal products would reduce saturated fat intake, which in excess can cause inflammation. Cyanide is a natural chemical found in plants so the endorsement here is not ringing. “Inflammation has also been linked to unbalanced levels of certain hormones, such as estrogen, progesterone, and testosterone. That’s why chronic inflammation often inflicts menopausal women, causing conditions like osteoporosis, weight gain, and adult acne.” This claim is not substantiated by any serious clinical research. None. “Foods that combat inflammation include tomatoes, green leafy vegetables and nuts like almonds and walnuts.” Well, no, that is not true at all. These foods simply do not promote inflammation, which is not the same as combatting it. Avoiding rotten food is not the same thing as treating food poisoning. Atkins, Dean Ornish, the Zone, South Beach, Glycemic Index… this list of fad diets too is nearly endless. Grocery stores sell magazines shouting out blatantly false claims that promise to help readers “lose weight like a teenager,” “lose belly fat,” “lose 11 lbs a week,” and “fill up on fat-burning super foods.” We are sold hormone supplements, told the benefits of “anti-inflammatory foods” and promised results if we only would take acetyl coenzyme A. These promises cannot be kept because they defy the simplest laws of biology and physics. Dr. Oz has on his website a section entitled, “The Top 10 Fat-Burning Foods.” This is what the FDA and nutritionists say about fat-burning foods: there is no such thing. Dr. Oz is conning you, feeding you pure nonsense, selling miracle cures no better than snake oil vendors of old. FDA says, “Consumers should know that there is no such thing as a fat-burning pill.” Just to be clear, the FDA adds further about fat-burning foods that, “No substance has ever been shown to actually do this.” It is a big lie, a scam. Among the attorney general’s findings was a popular store brand of ginseng pills at Walgreens, promoted for “physical endurance and vitality,” that contained only powdered garlic and rice. At Walmart, the authorities found that its ginkgo biloba, a Chinese plant promoted as a memory enhancer, contained little more than powdered radish, houseplants and wheat — despite a claim on the label that the product was wheat- and gluten-free. Three out of six herbal products at Target — ginkgo biloba, St. John’s wort and valerian root, a sleep aid — tested negative for the herbs on their labels. But they did contain powdered rice, beans, peas and wild carrots. And at GNC, the agency said, it found pills with unlisted ingredients used as fillers, like powdered legumes, the class of plants that includes peanuts and soybeans, a hazard for people with allergies. Supplement manufacturers routinely, and legally, sell their products without first having to demonstrate that they are safe and effective. Unlabeled ingredients found in many supplements are: bitter orange, chaparral, colloidal silver, coltsfoot, comfrey, country mallow, germanium, greater celandine, kava, lobelia, and yohimbe. The FDA has warned about at least eight of them, some as long ago as 1993. Of the more than 54,000 dietary supplement products in the Natural Medicines Comprehensive Database, more than 40,000 have no level of safety and effectiveness supported by scientific evidence. Next time you have an urge to take fish oil, ginger and ginkgo biloba, just pop some peas into your mouth; there is no evidence one is more healthful than the other. There is no room here to debunk the ocean of nonsense we encounter daily; this small sample of crazy is not even the tip of the tip of the iceberg. The voodoo surrounding probiotics and hormone supplements for example is each in itself a blog, or book. But understand that unless you restrict your intake of drugs and supplements to those proven to be effective and safe through rigorous scientific evaluation, you are just randomly putting stuff in your mouth. You should stop doing that. 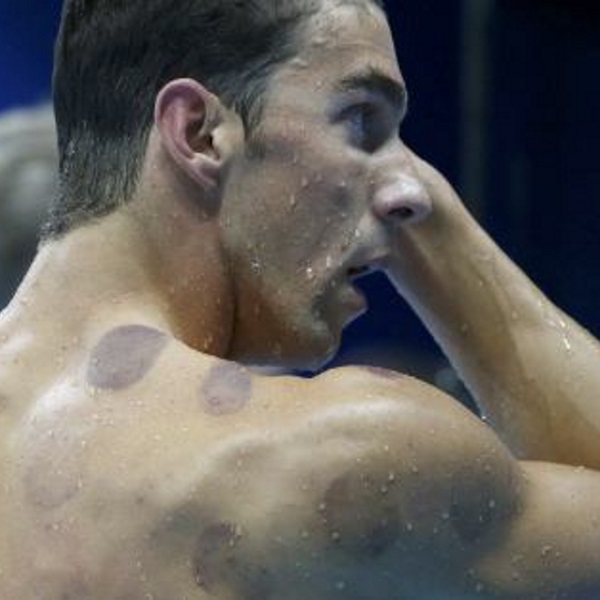 And Michael Phelps should stop cupping; it is embarrassing.